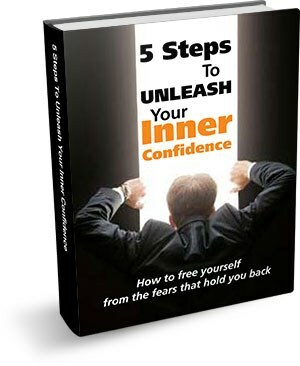 5 Steps To Unleash Your Inner Confidence! FREE Ebook! Click On The Button Below To Get Your FREE Copy Right Now! You feel nervous and uncomfortable before meeting new people. You feel tense or awkward during conversations and struggle to find things to say. You feel embarrassed and self-critical afterwards, wishing you’d been different. You feel an intense fear of starting conversations with attractive women. You have difficulty asking women out and often find yourself being just a friend. You hate putting yourself out there in a group and being the center of attention. You have a hard time speaking up at work and are often quiet in meetings. Co-workers and supervisors don’t seem to respect your opinion or appreciate your talents. This free eBook contains powerful techniques used by psychologists and life coaches to help you overcome your fears and self-doubts. 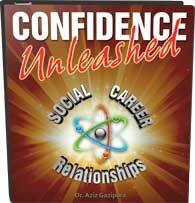 Whatever area your lack of confidence is impacting, this eBook can help you! It gives you some basic, easily applicable tools and strategies you can start using right now, today. As you change the way you think about yourself, you can feel more confident and enjoy the success you truly desire in your life. The true definition of social confidence. How to change the way you think about yourself. How to stop criticizing yourself and start being on your own side, no matter what. Techniques to start accepting yourself as you are right now. Overcome your fear of rejection. Feel more comfortable when meeting new people. Realize your strengths and increase your self-esteem. You’ll also learn the one essential thing you must do in order to build true self-confidence. No matter what your situation is, I believe it’s possible for you to feel more confident in yourself. The 5 Steps To Unleash Your Inner Confidence. Need immediate confidence help? Call now for a free consultation to learn more about Confidence Coaching offered here at The Center For Social Confidence. We have solutions for all budgets and any location.